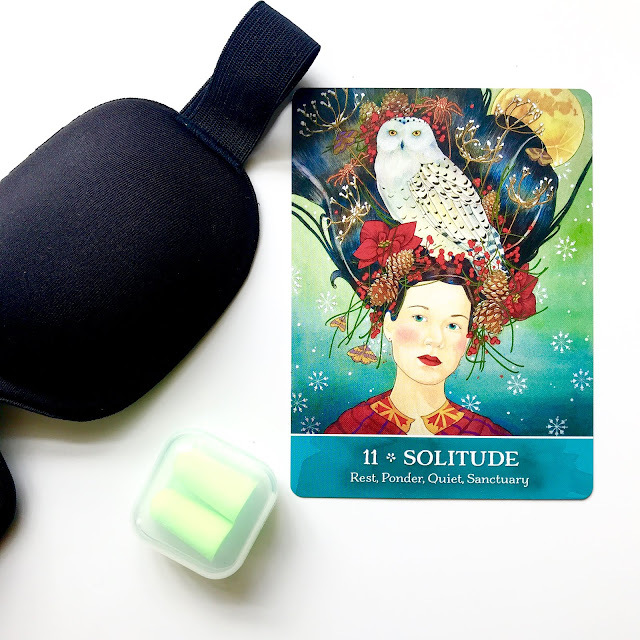 Ten days into the school holiday and today I'm craving some solitude, which is also the card I drew from Secrets of the Mystic Grove. As much as I adore the kids (they are generally quite awesome individuals so it's not a personal thing), I recognise that lack of solitude is a major challenge to my levels of peace and consciousness. When I can’t 'escape' for an extended period it's not unknown for me to start getting frustrated and antsy. Today's that day. Human interaction can be hell. Or it can be a great spiritual practice. - Eckhart Tolle, Stillness Speaks. As we prepare to go away for the final week of the holiday, I’m very much looking forward to walking the dog on the beach, visiting some of our favourite places, and spending time together without the pressures of work, my husband's commute, etc. However, beneath the anticipation I also recognise there is a building frustration at my own lack of personal space. I'm starting to feel resentful of each new cry of "Muuuuuuuuuuum" which I know will surely be followed up with a request for a(nother) snack, to know the length of time until dinner, or a sibling-related complaint. It's quite overwhelming and exhausting. In The Power of Now, Eckhart Tolle reminds us that relationships serve to magnify egoic mind patterns and activate what he calls the pain-body, but that we can choose to accept this and work with it. In fact, doing so brings opportunities for personal transformation. When you know you are not at peace, your knowing creates a still space that surrounds your nonpeace in a loving and tender embrace and and then transmutes your nonpeace into peace... What was unconscious is being brought up into the light. It is an opportunity for salvation. Every moment, hold the knowing of that moment, particularly of your inner state. If there is anger, know there is anger. If there is jealousy, defensiveness, the urge to argue, the need to be right, an inner child demanding love and attention, or emotional pain of any kind - whatever it is, know the reality of that moment and hold the knowing. The relationship becomes your sadhana, your spiritual practice. It's something that I'm working on. In the meantime, I'm taking them to the park. They can run around while I watch and get grounded. That's sure to help everyone! Solitude is something I really struggle with and so desperately need. Particularly in my spiritual practices. It's a mothers cross to bear it seems. I'm delighted I have found your blog, I'm new to practicing tarot and I love your take on things.